Gimmicky, but I like it. Hopefully these ladies go all the way this upcoming season. A national championship would be huge for them and for SBU and it's not out of the question this year for this team at all. Courtney Murphy was arguably the most naturally talented player in her recruiting class most other top programs had never heard of. She certainly wasn’t on any freshman watch list, either. But everyone soon learned her name when posted seven goals and eight points in her debut vs. Bucknell Feb. 15, 2014. She finished the season with 61 goals. No other freshman in the country had more. She was named to ILWomen’s All-Rookie Team. As much hype as she received, Stony Brook head coach Joe Spallina knew she could be better. He’d tell her if she became a full-time student-athlete, she’d be a first-team All-American. She fulfilled that prophesy her junior year, scoring 100 goals to break Delaware’s Karen Emas’ longstanding record of 98. But Syracuse ousted the Seawolves for the second time in three years. Murphy thought about it and finally started responding to her teammate’s messages. Around the same time, she received hundreds of cards from young Long Island girls, the same ones who are willing to wait more than an hour after a Stony Brook game to get her autograph. She wasn’t completely convinced, but she was starting to have a chance of heart. At the urging of teammates like Kylie, Van Dyke and Yevoli, she decided to travel with the team to Florida. Murphy had to keep pushing. Instead of starting a new job, she interned for the Wall Street firm, doing physical therapy at 4 a.m. twice a week. It was hectic and she wasn’t able to fully focus on her recovery. When she came back in August, she wasn’t cleared, a benchmark she had set for herself. With the “dream team” on the same page and a No. 2 national ranking, the expectations are higher than ever for the 2018 Seawolves. Murphy feels the weight, but after a year of wondering what the future had in store for her, she’s on board with one cliché: Any game could be anyone’s last. UA's longtime coach resigns, oddly right before the season, to spend more time with family. the asst takes over. could be a bad thing for us. or a good thing. or neutral. either way, relevant. The last time the Long Island school hosted was in 2012 after being awarded the rights for the first time in 2011. As a well-known hotbed, Kenneth P. Lavalle Stadium, home of the Seawolves, drew two of the six largest crowds in the championship game’s history. “The final four is in our building and we’re equipped,” Spallina said. The season starts in California against the Pac-12’s top teams, USC and Stanford, followed by Denver and Northwestern. If all goes well, a win in an April tilt against Penn State could solidify a seed and a potential first-round bye for the Seawolves. Among the 7,127 in attendance at the 2012 NCAA Division I women’s lacrosse championship at Stony Brook’s Kenneth P. LaValle stadium were two young sisters watching in awe as Northwestern earned its seventh national title with an 8-6 win over Syracuse. The Ohlmiller sisters, 10th-grader Kylie and eighth-grader Taryn, who would soon play together at Islip (N.Y.) High School and later Stony Brook, took in the atmosphere – the packed stands, the deafening cheers and the sight of Katrina Dowd, a Northwestern alum and Kylie’s role model for her creative style of play. With their personnel, says Spallina, championship weekend seems within reach, and according to Kylie Ohlmiller, Stony Brook has entered a new era. "We get to play as Long Island's team," Kylie Ohlmiller said. "We get to be those role models ... for the little girls on Long Island who are looking for those role models right here at home." In 2018, Ohlmiller will continue her three-hour morning workouts with her sister, cut in line to get more reps in and meet with Spallina after every practice because “she’s in a lot of ways an assistant coach for me,” Spallina said. The stage is set for the Stony Brook women’s lacrosse team to do something previously unimaginable. 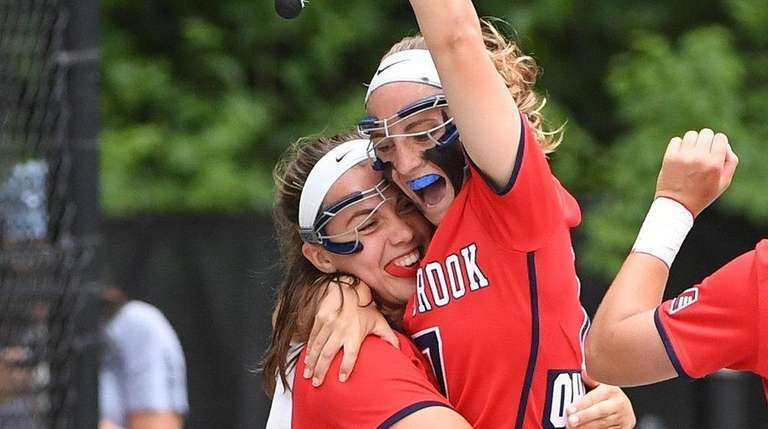 With the NCAA Women’s Final Four scheduled for Memorial Day weekend at LaValle Stadium, Stony Brook has the opportunity to win the national championship at home . . . and coach Joe Spallina knows he has the pieces to do it. Spallina’s defense ranked No. 1 nationally four of the last five years (it was No. 2 in 2016). The offense ranked third last season, averaging 16.09 goals per game. Redshirt senior Brooke Gubitosi said both units challenge each other. This all adds up to a potentially historic season. The Seawolves don’t see it any other way. Good to see the CAA take down a few of the high and mighty . Now its our turn this weekend out in Southern California. Nice tribute by Florida for the Colorado girl who died in that car accident real class . No. 2 Stony Brook nearly turned the upset of the year last season, falling by a goal at Maryland to be denied the program’s first NCAA semifinal appearance. The remarkable season was largely done without 100-goal scorer Courtney Murphy, who played in only four games. Now Murphy is back and she’ll be paired with Kylie Olhmiller, a 78-goal scorer from a year ago. The senior duo and their teammates are set to open their season at No. 5 USC on Friday. No. 5 USC vs. No. 2 Stony Brook (Friday, 10 p.m. ET): The offensive firepower of the Seawolves will face the stellar goalkeeping of USC’s Gussie Johns. Stony Brook holds a 2-1 lead in the series including last season’s 9-7 victory in New York. Friday’s game is being played at Lebard Stadium in Costa Mesa, California, as part of the Orange County Lacrosse Showcase. Women's lax is the only realistic option of SBU having a national champion in any sport for the forseeable future. Should be interesting.